The term "New Media" has been around since the CD-ROM age however the meaning and perception of new media has changed significantly. The definition is and will remain a bit vague since it depends on a combination of super changing factors including technological developments and social behaviour patterns. The meaning of New Media is rather easy to understand by stating what it is not. New media is not Newspapers, Television, and Radio. New media is also not supplementary but complementary to traditional media. Conduct a workshop about New Media for their product marketing and corporate marketing teams. Plan and Implement a complete multi-user blogging platform. Implement an end-to-end podcasting solution. The solution helps publish and track downloads/views of podcasts. New Media is our forte and can confidently say nonone in India knows as much as we do. We do get enquiries for Web 2.0 marketing needs however our friends at Webchutney, 2020social and WATConsult would be better bets for it. 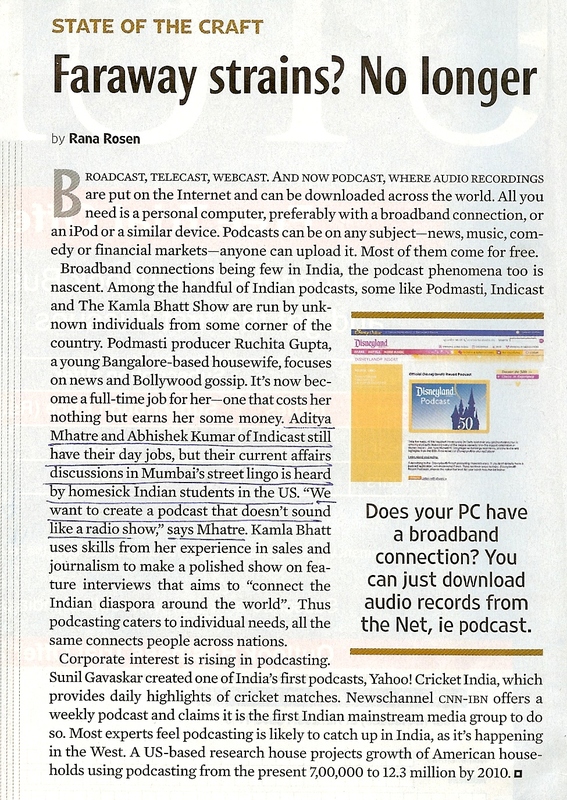 Indicast has been at the forefront of the new media developments in India ever since it released it's first podcast episode on the 10th October, 2005. Since then, Indicast has released more than 200 audio and video podcast episodes online. Indicast has not only gained valuable insights into new media production but also the nuances involved in new media distribution and consumer psychology. If you think we can help with anything on your mind, please drop an email (or call) using details on this contact form.